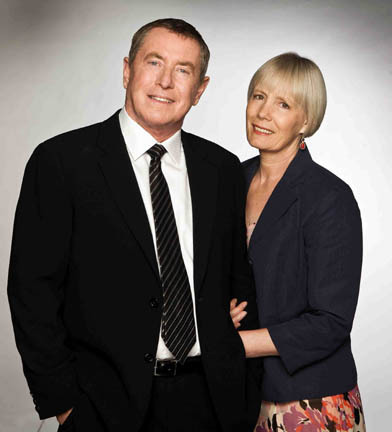 John Nettles' departure from Midsomer Murders was marked by a series of parties and presentations stretching over several months. John explains: "We had almost a year of parties! The first one was a press launch held at a typical Midsomer country pub with wisteria fading around the door where Jane Wymark and I posed for photographers for one final time as Mr and Mrs Barnaby." Ever generous with his time despite the hot summer day, John answered every question, smiled for the cameras and autographed press packs for the assembled journalists, before beginning a night shoot which took him through to midnight. Producer Brian True-May then held the first of many private parties to mark John's departure. John says: "It was a big bash at Brian's house in the heart of Midsomer country, again the sun shone from the outset and I came with my wife Cathy to celebrate with the production team and ITV executives. "Lots of the cast were there from over the years, a band played, the barbecue sizzled and the champagne flowed. Brian presented me with an engraved claret jug to hold my favourite tipple and we each gave speeches, but we kept it short and sweet as it was quite an emotional day." In the final week of filming, John and Jane took the centre seats for the last ever cast and crew photograph which included everyone involved in series 13. Adds John: "On the very last day of the shoot, at the final wrap, Brian bought champagne to the set and gave Jane a bouquet of flowers and presented us with a specially-made clapperboard showing Midsomer Murders' last slate. There were quite a few tears!" John's role continued even after filming had finished with promotional trips to Italy, Stockholm and Sweden. "Even if I have left the production, I haven't totally left the series as it has such a high international profile and we get invited to festivals all round the world. They can't get rid of me that easily!" he jokes. John began playing DCI Tom Barnaby 14 years ago in the pilot episode entitled The Killing at Badger's Drift following many years with the Royal Shakespeare Company. "I never thought at the beginning that Midsomer would last this long. When we started, I was a 50-year-old crazy dreamer and it seemed a good idea to get out of the tights for a change and do some telly. I thought that once we had adapted and filmed all of Caroline Graham's books, I would return to the decent obscurity of the theatre. "I think the series has succeeded because it is the quintessentially English whodunit with a pedigree stretching back through Agatha Christie and Dorothy Sayers as far as Conan Doyle. It celebrates the world's preconceptions about English society and particularly English village society which suggests that every vicar has a dubious sexual provenance, every spinster is a homicidal maniac and every child a potential killer, particularly if he has been near a public school. "I firmly believe that the international audience enjoys watching not only for the beautiful scenery, but because they believe that the eccentricities conveyed through the characters are absolutely realistic. The odd murder just adds to the entertainment." Adds John: I think above all it is a reliable and comforting escapist drama. The deliberately retrospective style harks back to an earlier time of deference, good manners and a general orderliness. This time is much preferable to our own - good always prevailed and evil was always defeated. As a matter of fact, that "golden age" never existed really but, we are talking of escapist drama here and there is none more escapist than in Midsomer. "It also has good storylines which almost without fail stump the viewer. It contains mystery and intrigue and some blood and gore but Barnaby has a 100 per cent track record for solving the crimes. So it is reassuring too." Making the decision to leave was not something John found easy. "It's been a great job. Although Barnaby and I are quite different, I am very fond of him and have enjoyed playing the role very much. I've relished the camaraderie and company of all the different actors who have graced our episodes down the years. I have enjoyed working with them all, without exception. "But by the end of series 13, I'd filmed over 80 episodes so I felt it was the right time to go. I didn't want to be the oldest policeman on the telly. I want to do more stage work and I see myself spending my twilight years treading the boards. I'm also planning to do a bunch of documentaries." John has wasted no time in fulfilling his aims for life beyond the series. His first job was to write and narrate an acclaimed documentary about the German wartime occupation of Jersey - his second home during the making of hit crime drama Bergerac - entitled The Channel Islands at War. Since then he has appeared on stage as Claudius in Hamlet at the Crucible Theatre, Sheffield, alongside John Simm, Michelle Dockery and Barbara Flynn. John's other credits include The Liver Birds, A Family At War, The Merchant of Venice, Romeo and Juliet and The Hound of the Baskervilles. He was recently awarded an OBE in the Queen's Birthday Honours for services to drama. As Joyce in Midsomer Murders, Jane Wymark has spent most of her time burning toast in the kitchen or helping out at village fetes. But her role as Barnaby's wife forms the anchor of the series. So when John Nettles decided to leave the series after 14 years, Jane was one of the first people he told. She explains: "John and I have been talking about him leaving for a long time - it hasn't come out of nowhere. When he said he felt it was the right time, I agreed. Enough is enough." Jane's pivotal role in the series is to show the sharp contrast between the strange characters and events in Midsomer and Barnaby's stable home life. "Domestic life is harder than it looks to do while saying your lines," she says. "Bustling is an underrated skill and I always notice when it's done badly. It drives me mad when I'm watching TV and I spot something like there's no coffee in the cup. "Joyce and Tom's marriage has evolved and they've become a bit sparkier. Joyce is not afraid to put her foot down or speak her mind, and in the final episode even gets Tom to spend a weekend in a spa. Of course, there's a murder, so he escapes! Adds Jane: "Joyce is a supporting character but I've also had a few chances to get out of the kitchen and into the action. There was one episode where Joyce was a judge in the best kept village competition and all the other judges got murdered, and another when Joyce is singing in a choir and she receives a death threat." Filming the final episode was emotional as Jane said a tearful goodbye to the cast and crew. "I'll miss the wonderful atmosphere on set and all the team, especially John and Laura Howard, who played my daughter Cully. She's become like a real daughter to me and takes me shopping. "But I'm relieved that I don't have to be the nicest person in the world any more. Joyce is very kind and caring, there's no malice in her at all and she doesn't indulge in gossip. That's a heavy burden to carry sometimes. Now I want to be an evil character with no redeeming features or play someone who's a great cook, as Joyce is so awful." The daughter of 1960s actor Patrick Wymark, Jane's TV credits include Poldark, Rob Roy, Between the Lines, Lovejoy, A Touch of Frost, Chalkface, Pie in the Sky and Doctors. Jane will be seen from this February in Racing Demon, one of three plays in the David Hare Season at the Crucible Theatre, Sheffield. She lives in London with her husband Paul, who works for the British Council, and has two grown-up sons. In her spare time she teaches drama workshops and enjoys singing and yoga.